Located in south-east Asia, the Republic of Singapore enjoys the hot, humid climate typical of equatorial regions, with little seasonal variation in temperature and an abundance of rain. This “wet and warm” island city state experiences rain showers almost every day of the year, but the intensity of rain increases during the two recognised monsoon seasons: the Northeast Monsoon between December and March, and the Southwest Monsoon between June and September. The rain is welcomed by locals and visitors alike to provide some relief from the almost constant high temperatures, which average between 25°C (77°F) in the coolest month of January and 31°C (87.8°F) in the hottest month, which is April. Humidity levels seldom fall below 70%, exacerbating the heat. The northeast monsoon is experienced from December until March, but is at its height during December and January, bringing almost daily occurrences of heavy downpours in the late afternoons. In February and March the incidence of showers is rather less. The southwest monsoon, between June and September, by contrast , consists of light, frequent showers interspersed with heavy ones, falling mainly in the early morning, accompanied by a southerly wind. All in all, Singapore has an average annual rainfall of 2,342mm (92.2 ins). When is the best time to go to Singapore? With an equitably hot and wet climate, it is difficult to single out the best time of year to enjoy a holiday in Singapore. Those sensitive to humidity, however, will find humidity levels are lowest during the recognised summer months of May and June. During the two monsoon seasons temperatures are somewhat moderated by the rain, but humidity levels are then at their highest. The peak of the wet periods can disrupt air travel. It is generally accepted that the best time of year (regarded as peak tourist season in Singapore) is between January and April. Bring quick-drying clothing that is comfortably loose and light. While T-shirts and shorts are acceptable, remember that Singaporeans take great pride in their appearance, so keep neat and tidy even when wearing casual clothing. Pack trousers, short and long sleeved shirts, as well as some smart clothing for an upscale restaurant. Mosquito repellent is important, but otherwise it's easy to pick up medication here. In summer, sunscreen, hats and sunglasses are essential and, because it rains year-round, carry a light raincoat and umbrella. Wear comfortable shoes – trainers will do – when exploring Singapore on foot and walking sandals or even flip-flops are also great for the hot and humid weather, especially at the beach. Indoor areas are usually under a heavy AC system and, while it won’t be needed much elsewhere, a jersey, scarf and jeans are good for mall days and movies. Note: January rates as the coolest month of the year in Singapore, but in a country where high temperatures are the norm, this is relative. It is also the height of the country’s northeast monsoon season, with daily evening downpours likely. Note: A congenial month for tourists to visit Singapore, February sees the tailing off of the northeast monsoon season, bringing less rain but with relatively comfortable temperatures and humidity levels in this equatorial country, where it is wet and warm all year round. Note: Although statistically March is the driest month in Singapore, the figures are simply relative to the prevailing climate in this wet island state, with showers possible during part of almost every day. Temperatures and humidity are high, however, and the rain can therefore be welcome for holidaymakers. Note: Although the average temperature in Singapore remains rather stable throughout the year, April is recognized as the hottest month when variables can send the thermometer soaring to record levels on some days, made more noticeable by the cessation of the monsoon season and high humidity. Note: In the heart of the inter-monsoon season, May has relatively low precipitation but is one of Singapore’s hottest months. That does not mean you will escape the odd shower on your Singapore holiday, but these will be short and sharp and probably welcomed for relief from the heat. Note: The southwest monsoon season in Singapore sets in during June, bringing an increase in rainfall, but these fall mainly in the early morning, meaning that if you are enjoying a holiday in Singapore this month you will likely not be drenched when out and about. The heat and humidity remain high, as they are all year round in Singapore. Note: Although the southwest monsoon season is in full flight during July in Singapore, the rain comes early in the day and temperatures ensure you will still sizzle when the sun comes out. Note: Caught in the grip of the southwest monsoon, Singapore is wet and occasionally windy during August. The rain, however, tends to fall before noon, so afternoons and evenings are hot and humid, providing ideal holiday weather. Note: In September Singapore enters the second of its annual inter-monsoon seasons, when the incidence of rain showers reduces but the weather follows the familiar pattern of remaining hot and sticky. 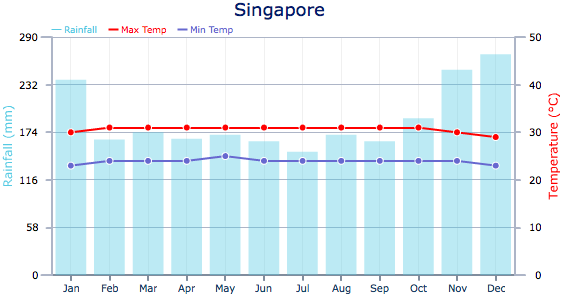 Although statistically September is the driest month in Singapore, you would still be wise to bring a brolly. Note: The southwest monsoon season may be a thing of the past when it comes to the weather in Singapore in October, but there is still a preponderance of rain on the cards in the form of showers in the evenings. The temperature and humidity remain constantly high in this country situated just one degree from the equator. Note: Singapore weather becomes a little wetter as the weeks of November go by, heading towards the northeast monsoon season, characterized by heavy showers in the late afternoons and evenings. There is plenty of sunshine to be had before the showers, however, and the heat is not inclined to let up, even when the rain falls. Note: December may well be the wettest month in Singapore, due to the onset of the northeast monsoon, but this does not cool the attractiveness of the destination or the temperature climate-wise. This equatorial enclave remains a hot destination, literally and figuratively, and is well set up to deal with the damp weather.